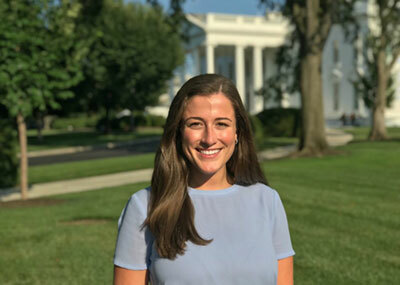 Cassidy Hutchinson ramps up career in public service with high-profile White House internship. For as long as she can remember, senior Cassidy Hutchinson has admired the men and women who enter public service. A former intern for House Majority Whip Steve Scalise and Senator Ted Cruz, her latest stint on the Beltway took her to the executive mansion. "I have set a personal goal to pursue a path of civic significance," she says. "Interning on Capitol Hill confirmed my desire to continue a path in government, and when I learned about the White House internship I was eager to apply." The White House Internship Program is a hands-on opportunity designed to mentor and cultivate young leaders and prepare them for future public service. It is a highly coveted summer gig, with a rigorous screening process. "I was brought to tears when I received the email that I had been selected to participate," Hutchinson says. "As a first-generation college student, being selected to serve as an intern alongside some of the most intelligent and driven students from across the nation – many of whom attend top universities – was an honor and a tremendous growing experience." Hutchinson worked for the Office of Legislative Affairs, which advances the administration's agenda in Congress. Her days often began with a daily strategy meeting with White House senior staff. Typical responsibilities involved drafting public messaging in support of administration priorities, facilitating communication with Congress, and assisting legislators at White House events. For Hutchinson the most memorable part was the day-to-day exposure to the inner workings of the government, and the opportunity to leave her mark. "I attended numerous events hosted by the president, such as signing ceremonies, celebrations and presidential announcements, and frequently watched Marine One depart the South Lawn from my office window," she says. "My small contribution to the quest to maintain American prosperity and excellence is a memory I will hold as one of the honors of my life." Back at Christopher Newport, Hutchinson has buckled down for her senior year. "My classes are intellectually stimulating, yet it's my professors that will be my fondest memory," she says. "They have provided an enriching educational experience both in and out of the classroom while offering constant encouragement." She adds that CNU has helped her develop her professional skills through various events, such as career fairs and guest speaker series. "Having the opportunity to participate in these events prepared me for professional interviews and pursuing workplace relationships." After graduation, Hutchinson plans to head back to the nation's capital to continue her burgeoning political career. "I'm keeping every opportunity at my fingertips and am open to any job that comes my way," she says. "I am confident I will be an effective leader in the fight to secure the American dream for future generations, so they too will have the bountiful opportunities and freedoms that make the United States great."